There was a time not very long ago when Microsoft, one of the greatest capitalistic success stories of the 20th century and still one of the world’s major patent holders, declared itself the defender of free enterprise against the open source movement. You can’t blame some folks for being skeptical when a company by the same name, though headed by different people and refocused on the cloud hosting business, announces its intent to acquire the most prominent brand in collaboration and automation for version-controlled, open source software. Then after the argument got out of hand, and certain genitalia were referenced, the developer unpublished his kik, along with all his other modules. The result was an avalanche of broken software within hours, on account of all the dependencies that other firms’ code had upon Koçulu’s. Although that problem was quickly repaired, the incident shed light on how deep the interdependencies between open source components had become — even as the era of commercial containerization was just beginning. Monday, after Microsoft’s and GitHub’s joint announcement, members of the Go language’s general discussion list golang-nuts gently brought up the issue of whether they should think about protecting themselves against a similar contingency with GitHub going forward. Several commenters there expressed confidence in statements by outgoing GitHub CEO Chris Wanstrath that the repository system will continue to be operated independently. That said, some are advising Go contributors to keep their options open. At issue: If a development organization should decide to move its repository to any new location, can it avoid breaking the code of others who rely on their ability to import the modules in that repository? At least one contributor is considering using Fossil, which includes bug tracking and an integrated wiki in addition to version control. Another long-time contributor named David Skinner, who says he has begun warily looking into alternatives, suggested that developers begin using a technique called vanity imports. Essentially, it’s a way to replace the github.com sourced package name from the import path of your source code, to your own domain. There, your index page would include an HTML meta tag that contains a pointer to the present address of your source code repository. The Go command line tool go get knows to look up that index page before accepting any URL as the sole source location for a dependent module. If a developer or organization felt it did have to make the move, all it would need to do is edit the meta tag to point to the new repository location. This method of indirection is what could give GitHub users a way to silently slip out of the system, should Microsoft’s present leadership peel off their wax lips and face masks to reveal Steve Ballmer and Jim Allchin were hiding there all along. Skinner’s prudence may be shared by contributors to well over 100,000 repositories, according to competitive service GitLab. 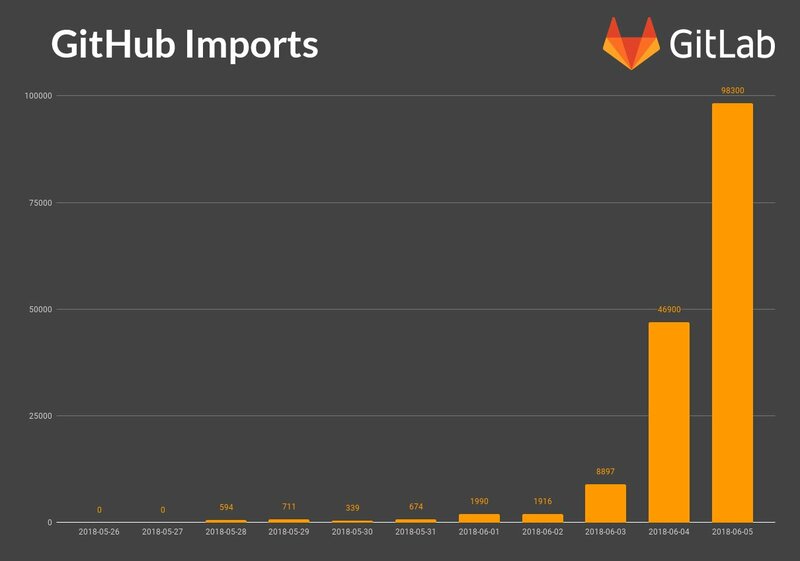 Those contributors have begun importing their GitHub repositories to GitLab just in the first three days after the purchase rumor began spreading. Yet at the same time, Skinner’s comment is indicative of the more mature, mindful tone taken by professional open source developers today. For them, the whole purpose of a “stack” is to enable options for coupling and connectivity of services, that can be decoupled and reconnected later whenever the conditions warrant. Some of the Go developers in the golang-nuts group are discussing the possibility of leveraging a project called Interplanetary File System (IPFS), perhaps coupled with a blockchain element, to devise a kind of peer-to-peer language repository system. Written in Go itself, according to its creator Juan Benet, IPFS “seeks to connect all computing devices with the same system of files. Unlike GitHub, which relies upon the Web as its addressing system for resources, IPFS would utilize its own distributed hash table, along with what Benet describes as a “self-certifying namespace” to deploy a single Git repository like a massive, ongoing BitTorrent. While IPFS is an attractive technology, or at least a prospective one, it may be missing the point altogether: Microsoft’s forthcoming $7.5 billion stock transaction was not so it could own a piece of Linux, but to have a handle on a healthy business that now collects $200 million in revenue annually. GitHub’s business model is its enterprise-grade, private software repository service. The public service builds the community, but the private one keeps the lights on. Bias told us he believes Microsoft’s move will benefit the open source ecosystem as a whole. There will be some veterans from the past who remember Microsoft’s past stance and the way it managed to douse grassfires with gasoline with its incendiary comments toward the community. That company, in his view, no longer exists. Still, he suggests that we view the transaction in a much broader context: Though GitHub may have become the de facto source for all version-controlled source code, it has not always succeeded in taking that next step of building an ecosystem — of either building or enabling other tools to establish orbits around GitHub. Case in point: Although GitHub has made its own efforts to incorporate bug tracking, the vast majority of users, as Bias perceives them, prefer to use Atlassian’s Jira. And so it begins! Excellent effort to start federation of Git hosting services right here https://t.co/AQ2rA25HfU and yes that's an ironic place to host it. One of those developer hubs to which Bias was referring was CodePlex, Microsoft’s 2009 effort to establish what it then called an “independent” cooperative source code exchange, to compete against the largest such effort at that time, SourceForge. It hasn’t escaped notice entirely that one of the board members for that early effort was Miguel de Icaza, the developer of Mono (the first open source .NET implementation) and the co-founder of Xamarin. Microsoft would acquire Xamarin in 2016, and in so doing, officially hire de Icaza and the other co-founder, Nat Friedman… who now is being appointed CEO of the new GitHub. Based on data collected throughout last year and compiled by Google’s BigQuery engine, Microsoft employed the highest number of GitHub contributors for 2017, taking part in the second highest number of repositories worldwide, behind Google. Its own most active repository is VS Code, for the Visual Studio Code editor, which recently displaced its namesake predecessor Visual Studio as Stack Overflow users’ most popular developer environment. 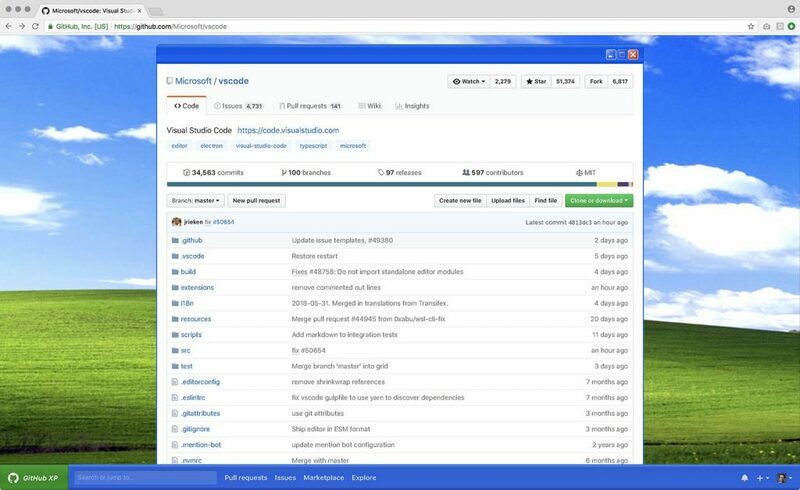 The company’s pre-existing Visual Studio toolchain still has its strong supporters, he noted. But those folks are mainly Windows developers, where modern methodologies such as CI/CD have taken a bit longer to catch on. To be an open source “community member” today is not necessarily to have joined some political movement or adopted some moral dogma. Indeed, open source is software development in the modern age, as Microsoft itself has demonstrated. Feature image: A Windows XP-inspired theme for GitHub by Martin Bjork, available now on GitHub.